The last Sunday of the months; when the family was almost exhausted with the budget but nowhere in the position to make the kids understand that was the time for Keema Curry! When they were bound to satisfy each and every member of the 28 membered non-vegetarian family; with limited meat, that was the time for Keema Curry. When a few grams of Keema cooked with a kilogram of Potato to make everybody happy, that was the time of Keema curry at my North Calcutta Residence. Another post; again going back to the memories of childhood! There are a few delicacies which for me are more emotion and less food. 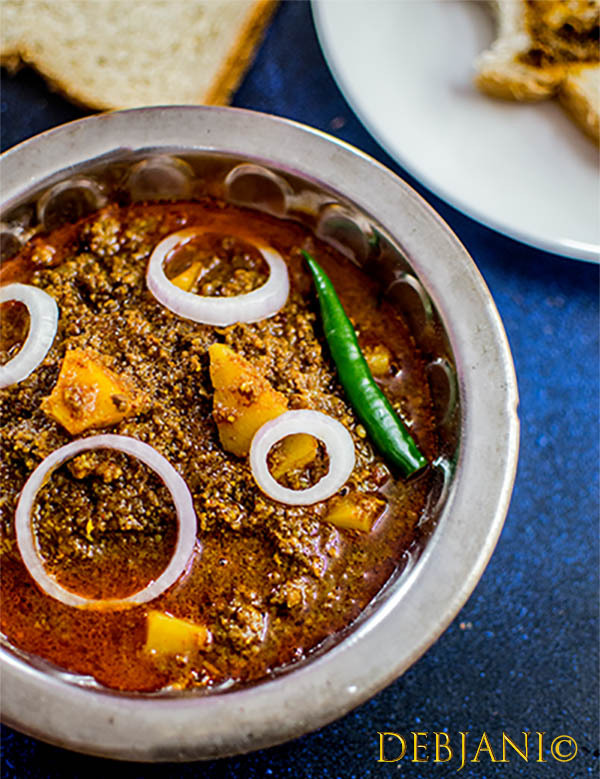 Bengali Aloo Diye Keema Curry is one such item. I have seen; my mother and aunts cooking this runny meaty delicacy for years to make the big fat family happy. I have seen them cooking 500g of mincemeat for a 20+ membered family with 1 kg potato. Needless to say, that was enough to make us happy. The Runny Keemar Torkari, the way it was called back home was all love. 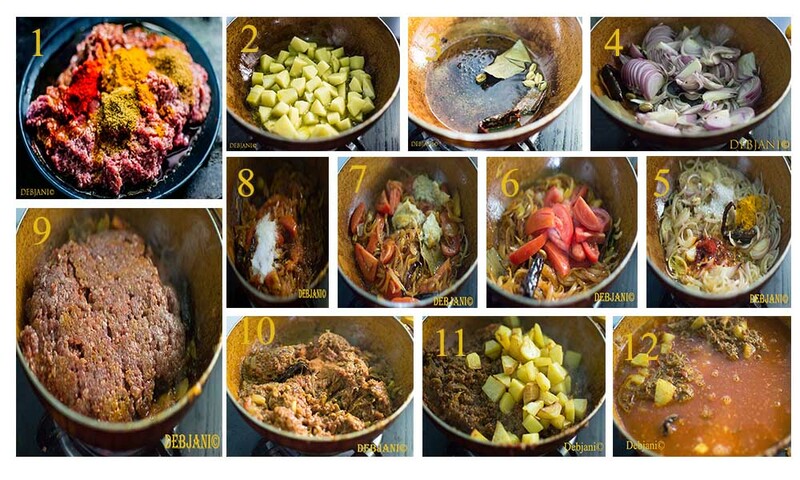 A runny red colored curry prepared with Mutton mincemeat and potato, Bengali Keema Curry was sheer emotion. It was not a lunch preparation at my place. It used to be the dinner favorite with hot and fluffy Roti. I, though, always preferred Keema Curry with Pauruti (read Bread slices). In fact, upon my request Mamoni (my aunt) used to save a bowl full of curry for my breakfast next day! Looking back I know how special those days were. Now when I go home, I see them making the same dish, well not with the same apprehension! The recipe, I am going to share is just the way they cook it till date, with love, with care. I just learned it from the iron ladies from my family. I just have changed a small thing here. My recipe is not about the limited amount of Mincemeat instead a bit extra of the same. You can, however, reduce it to half and believe me the taste will not differ. Last but not the least, the recipe calls for Aloo. 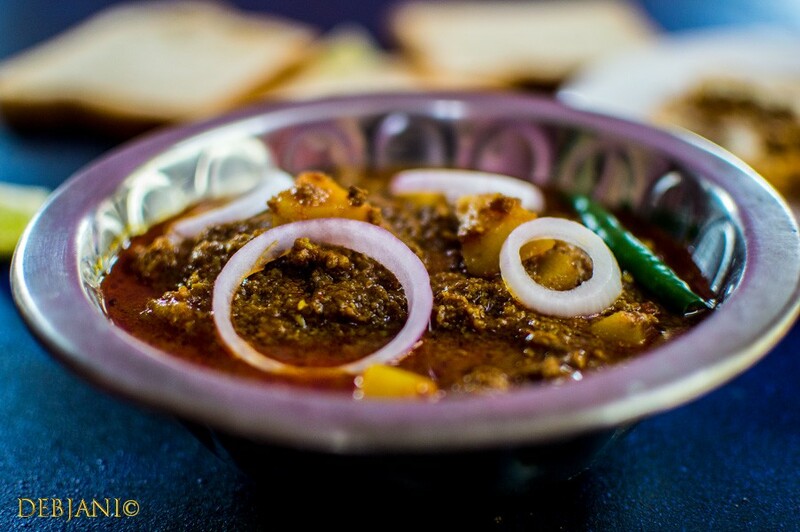 The combination of little mutton chunks along with potato chunks makes is special. Color is another important aspect. To me, Keem Curry means a red colored mincemeat curry with potato chunks and with a layer of oil over the top of the curry. Maa used to add a paste of dry Red chili while cooking the dish for the red-hot color. However, I add Kashmiri red chili powder. 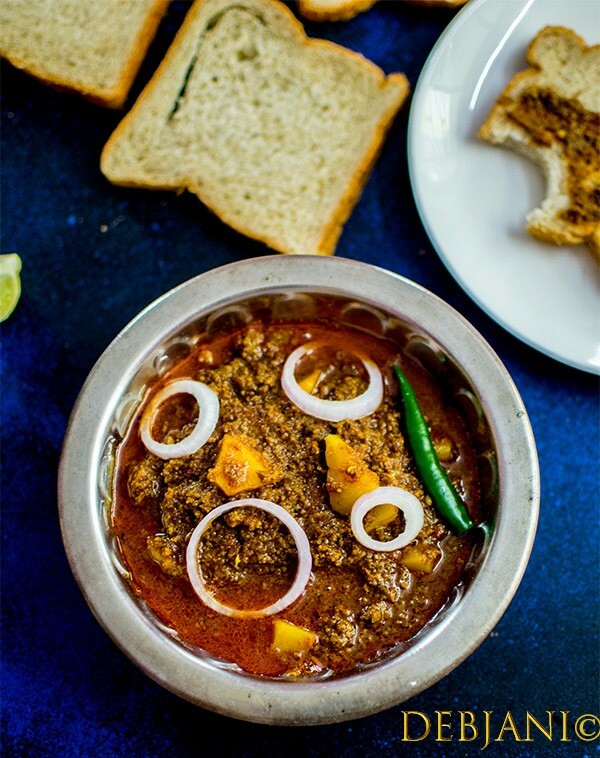 Wash Mutton Keema under running water and drain excess water from the mincemeat. Now marinade the mutton with half of Kashmiri Red Chili Powder, Turmeric Powder, Cumin Powder, Coriander Powder and 1 Tbsp. Mustard Oil for 1 hour. Peel the potatoes and cut into small cubes. Cut Tomatoes into small pieces. Heat 3 Tbsp. of Mustard Oil in a pan and fry potato cubes till those turn golden brown and crips. Temper remaining oil with Dry Red Chili, Bay Leaf, Green Cardamom, Cinnamon Stick and Asafoetida. Add Sugar at this point and cook on slow flame till the sugar melt and caramelize. Now add chopped onion and fry till those turn translucent. Add rest of the Kashmiri Red Chili Powder and Turmeric Powder at this point and fry for 2 more minutes in low flame. Now add chopped Tomatoes followed by the Ginger and Garlic Paste and cook till the Oil separates. Add Salt and rest of the Cumin Powder, Coriander Powder along with half of the Garam Masala Powder and cook for a minute on low flame. Now add marinated mincemeat and mix thoroughly. Cook the meat covering the pan on low flame and stir in between. The meat will release water. Cook for around 5 minutes on low flame. Add fried Potatoes and mix again. Now add 3 Cups of boiling water and cook on low flame for 15 minutes. Based on requirement adjust the gravy. I prefer the dish to be served with gravy and hence I add some more water just before finishing the dish. Add rest of the Garam Masala and 1 Tbsp. of Mustard Oil and boil the Curry over the high flame for 5 minutes and switch the flame off. 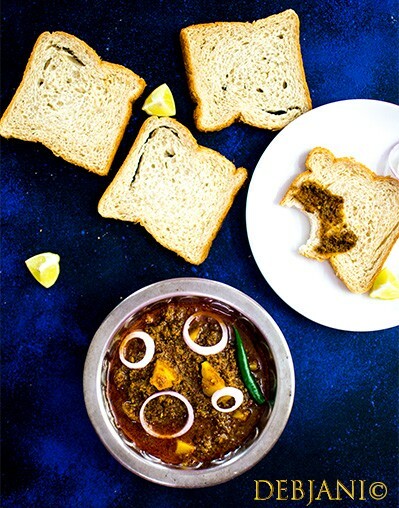 Serve Bengali Keema Curry with your choice of rice or bread hot. In case using normal Chili Powder instead of Kashmiri Red Chili Powder, reduce the amount. I like it best with the bread slices; however it goes amazing with Paratha or Roti and even with plain rice. 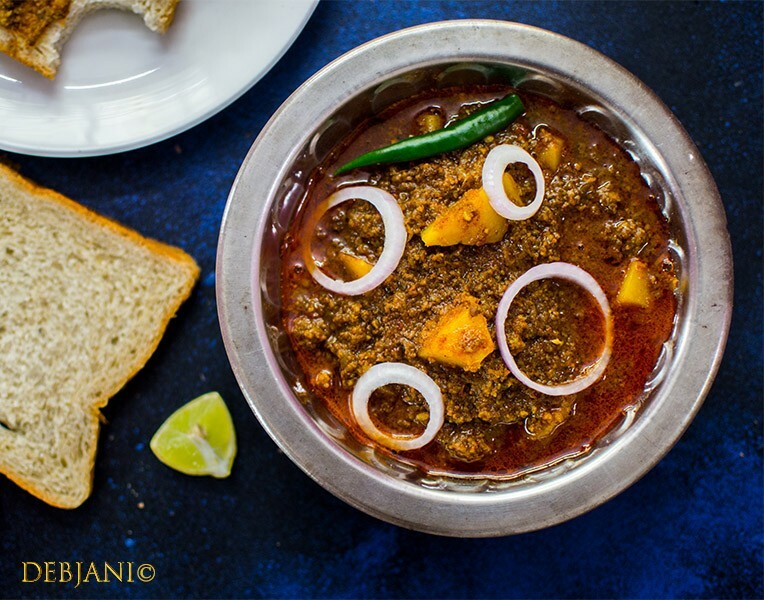 Have you tried the Bengali Keema Curry from Debjanir Rannaghar! 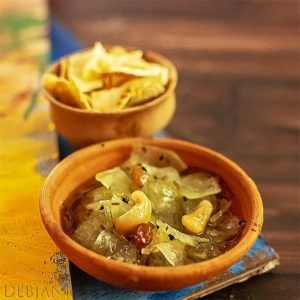 « Gur diye Topa Kul ar Tometor Chutney; it is all about chetey chetey Khawa…..